If you follow the news and political opinions closely like we do, you may find yourself confused. Sorting out a news event can be equivalent to deciphering ingredients in a blender turned on high. In the old days, we could rely on a single TV news anchor such as Walter Cronkite to keep us informed. With his grandfatherly voice, he was the voice of reason and truth. Of course, we now know it was all a crock. He read lines written by the CIA. Good old Walter was also a devoted globalist and member of the Deep State. He presided over Bohemian Grove ceremonies and once claimed pride at being at the ‘right hand of Satan.’ Cronkite has journalism schools named after him even though he lacked a college degree in the subject. He was a top Freemason, though. Investigative journalism is on the wane. Newspapers are getting staff and budgets slashed. Newspapers are going away. TV news is going away, too. Nowadays we find our news on the Internet in millions of fragments. We are bombarded with interpretations, analysis and predictions from thousands of ‘experts' and news personalities. 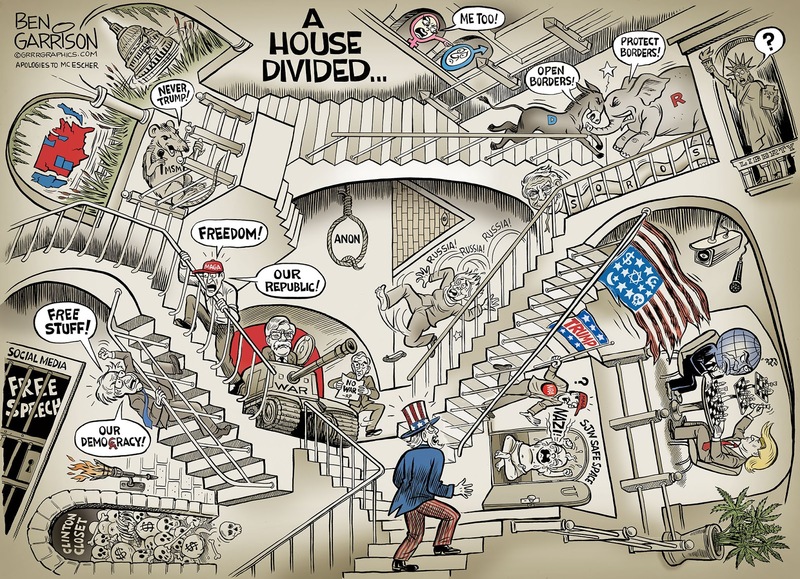 This is occurring as our country has become more divided than at any time since the Civil War. 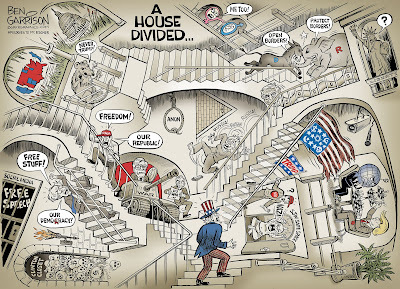 Therefore, I decided to draw this cartoon—based on a famous Escher drawing—to show the confusion and division. There’s nothing profoundly satirical going on here—I’m merely illustrating the existing situation. So who do we believe? I have a few tactics. For example, If I come across opinion or slanted news crying for more government involvement or war, I reject it. If it smacks of socialism, I dismiss it with great alacrity. Take Bernie Sanders for instance. Many young people are in love with his idea of ‘free stuff.’ He calls it ‘democracy.’ Don’t take my word for it, though—go to his site and you’ll see a page he titles ‘Democracy Daily’ where he promotes socialism. We are a republic, not a democracy. Democracy is the road to socialism, that’s why so many lefties say ‘democracy’ over and over again. They know a majority of people—especially immigrants--will always vote for free stuff at the expense of freedom. Bernie not only says ‘our democracy,’ he also uses old Communist catchphrases such as “our struggle.” One does not require an expert to help in the realization that ol’ Bernie is pushing the same old failed socialism that has been a disaster wherever it has been tried. Yes, even in Sweden. The lefties love to cite that country as an example of ‘good’ socialism. Nope. No such thing. Sweden avoided WWII and still had capitalism and an intact industrial base and became wealthy as a result. That enabled their form of socialism to coast for a while. But now they’re going to go broke just like Venezuela. Especially since they’re importing more and more free stuff-demanding Muslim ‘immigrants,’ who tend to have large families. A rising crime rate is also costly. Next time you’re trying to decide on who’s right amid the confusion, consider whether it is in line with our belief in freedom and individual liberty. Forget trying to figure out what “Q” is saying. We don’t need a secret decoder ring. We have the Constitution.